The Department of Education (DepEd) has signed an agreement with the provincial government of Albay—the host of the2016 Palarong Pambansa in Legazpi City—stipulating the duties and responsibilities of both parties to ensure a well-managed and professionally-run annual national sporting event. DepEd Secretary Br. Armin Luistro FSC said this year’s staging of the Palaro will have many “firsts.” “I want to highlight that this is Albay’s first ever hosting of the Palaro. This is also the first time that 18 regions will take action -- not the usual 17 regions --because of the participation of the Negros Island Region,” he explained. Based on the Republic Act No. 10588 also known as the Palarong Pambansa Act of 2013, the elementary level would have to compete in 15 games and the secondary with 17 games and four (4) demonstration sports, namely Futsal, Wushu, Billiards and Wrestling. In addition, four special games will also be conducted for our special athletes. Participated in by elementary and secondary students from public and private schools nationwide, the annual sporting event will be held at the Bicol University, Legazpi City from April 10 to 16, 2016. “We are institutionalizing this sports program to ensure that we are developing athletes that are of international caliber,” Luistro pointed out. Together with the Philippine Sports Commission (PSC) and the provincial government of Albay, DepEd will see to it that the standards are at international level and that the coaching staff, the technical officials as well as the playing venues conform to international standards,” the education chief said. Albay Governor Joey Salceda responded by stating the province’s readiness and eagerness to host the Palaro. “We want to show that it will be a joyful Palaro. It's something that celebrates the spirit of national unity, especially in Albay. Siguro kung mayroon isang bagay to define Albay, it is our resiliency or ability to recover from adversity—na kahit may bagyo ngayon, paggising mo kinabukasan, ni-isang pirasong kahoy wala kang makikita sa daan. 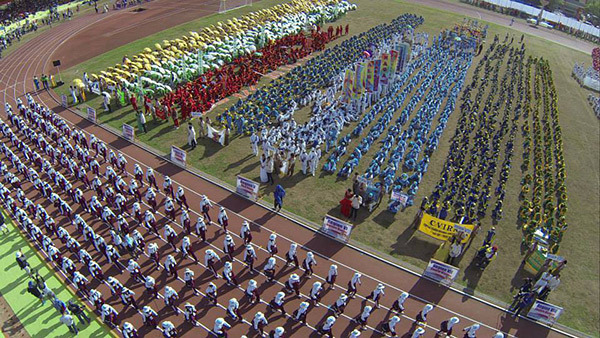 Gusto naming ipakita na ang isang bayan, no matter how modest, no matter how limited its capacity, will still have the unity and ability to host the Palaro,” Salceda shared.